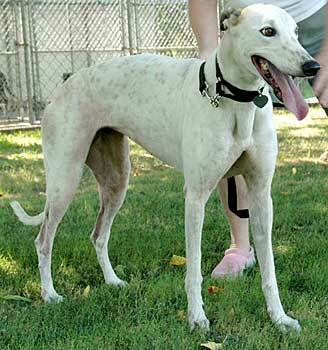 Desiree, aka AZ Desire, is a gorgeous white and red ticked 5½-year-old female greyhound, born January 30, 2000. Her sire is Basic Benefit, making her grand sire Oshkosh Racey, and her dam is Senior Desire, making her grand sire Fortress. 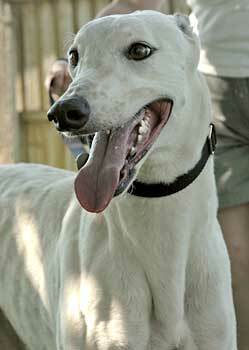 Her racing career was spent all at Gulf Greyhound Park in La Marque, TX, starting September 16, 2001 and ending December 3, 2002. Because of her excellent lineage, her owners wanted her to be a brood matron, but have since decided she should find her forever home. Desiree is very affectionate. She is living calmly with cats in her foster home. Desiree is a delight! Her manners since coming into our home, have been beautiful! She was just a little shy when she first got here, but every day she comes out of her shell a little bit more! She's had no problems adjusting to living with cats, she barely even notices them, she seems to like the company of her foster dog brother & sister, and she's very well behaved with my 3 kiddos! Desiree seems to really enjoy being outside. She would prefer to have human company while out there, but she has already learned to use the doggie door, so that she can go outside to do her business. She really loves to lay in the grass, in the sunshine and roll! It's really very cute! She doesn't really like to be in a crate, and I suspect that she would be fine without one. We do crate her before we leave the house, though. While we're here, she hangs out around people or the other dogs, and she has had no problems. 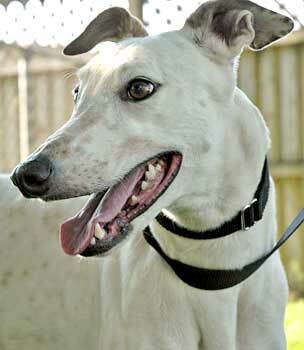 She likes to collect things, as many greyhounds do. Not chew, just gather. At first we thought she was taking them to her bed with her, but it seems she just likes to carry things around a bit. Desiree is just learning to play and gets really excited when you squeak a toy at her! She doesn't seem to know exactly what to do, but she seems to enjoy the squeaks none the less! In time I think she'll learn to be very playful!